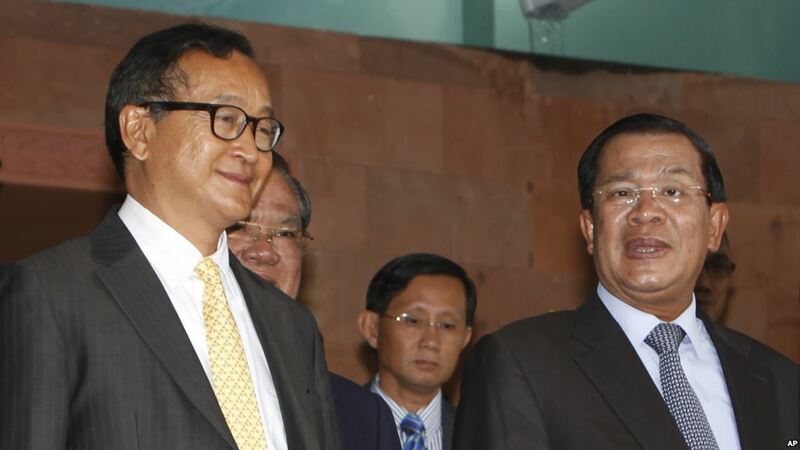 FILE PHOTO - Cambodian Prime Minister Hun Sen, right, talks with the main Opposition Party leader Sam Rainsy, left, of Cambodia National Rescue Party, after their meeting in Senate headquarters in Phnom Penh, Cambodia, Tuesday, July 22, 2012. 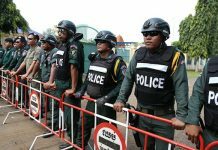 So far nine former CNRP officials have taken up the prime minister’s offer of an amnesty ahead of a deadline for applications in April. 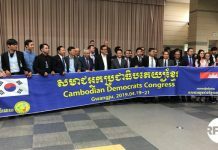 Washington, D.C – Prime Minister Hun Sen has said Sam Rainsy, a leader of the former opposition Cambodia National Rescue Party, is responsible for divisions in the party amid a call for ex-CNRP politicians who were banned from politics to seek pardons and disavow their membership. Rainsy had publicly stated that the divisions, caused by the offer of royal pardons for more than 100 former CNRP officials who were banned from political life when the party was dissolved in late 2017, were the fault of Hun Sen. But in a speech last week, Hun Sen blamed the divisions on Rainsy’s apparent lack of leadership.